Give the train spotter in your life a piece of railway history with this wonderful Flying Scotsman 4-6-2 LNER Class A1 replica tin. Filled with 150g of Fruit and Nut Mix and 100g of Assorted Toffees, this unique gift will hang around long after the contents have been enjoyed. A beacon of modern achievement, Flying Scotsman represents a Golden Age of British ingenuity and evokes the glamour, elegance and romance of the Art Deco period. The detailed tin measuring L335mm x W43mm x H68mm, will make a popular gift anytime of the year: birthdays, Christmas, anniversary. All aboard! INGREDIENTS: Wheat Glucose Syrup (contains Sulphites), Sugar, Compound Chocolate [Sugar, Vegetable Oil, Whey Powder (Milk), Cocoa Powder (4.8%), Full Cream Milk Powder (Milk), Emulsifier (Soy Lecithin), Natural Flavour], Sweetened Condensed Milk (Milk, Sugar, Lactose), Vegetable Oil, Water, Salt, Licorice Extract, Natural Flavours, Stabiliser (339). INGREDIENTS: Milk Chocolate (39%) (Sugar, Milk Solids, Cocoa Butter, Cocoa Mass, Emulsifiers (Soy Lecithin, 476), Flavour. Dark Chocolate (39%) (Cocoa Mass, Sugar, Cocoa Butter, Milk Fat, Emulsifiers (Soya Lecithin) 476), Flavour. Nuts (18%) (Peanuts, Almonds), Fruits (3%) (Sultanas), Sugar, Glazing Agent (904), Milk Solids, Cocoa Powder, Mineral Salt (553b), Thickener (1400), Preservative (220). CONTAINS: Sulphur Dioxide (in Dried Fruits) May contain traces of other nuts. 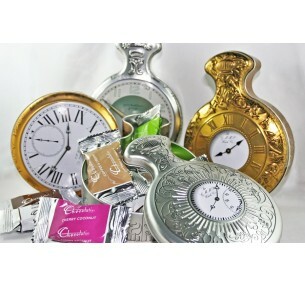 Give the vintage enthusiast in your life this wonderful retro clock radio gift tin and put a smile o..
ONLY 1 LEFT! (Gold) Tick, tock, there's no time like the present to give this unique Pocket W..